British Gas, the UK's biggest power provider, is to raise the amount it charges for gas and electricity by 15%. The announcement followed increases from rivals Npower and EDF Energy, with the firms blaming high wholesale costs. 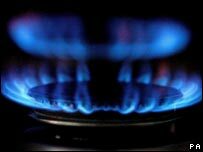 British Gas, owned by Windsor-based Centrica, said that it would make a loss this year without the price rise. Consumer groups and the Unite trade union have criticised the move, saying it would make life harder for firms, the elderly and those on low incomes. Before the British Gas move, Npower raised its electricity prices by 12.7% and gas by 17.2% earlier this month. EDF Energy also put up its electricity tariffs by 7.9% and gas bills by 12.9% this week. The Unite union called the recent increases by the power companies "excessive" and said that the government should look at ways of increasing taxes on their earnings. Consumer group Energywatch said that the firms' clients were less concerned about why prices had risen and were more interested in whether or not the increases were justified. Adam Scorer from Energywatch said that was a "difficult question to answer". However, he claimed that it was clear that "the people who really suffer the most when we see extreme price rises in the energy market are those who, sadly, can least afford it". British Gas-owner Centrica defended its price increase, arguing that market conditions had changed significantly. "In the last six months of 2007, higher wholesale gas prices have reduced British Gas operating margins to around 1%," it said. Centrica added that at current wholesale prices British Gas "would be loss making in 2008 without the increase". It also blamed rises in the price it has to pay to transport and distribute energy, as well as the cost of meeting the government's targets for the use of renewable energy sources and reducing carbon emissions. The 2.4 million British Gas customers on fixed-price tariffs will not be affected. The statement added that 340,000 vulnerable customers on its Essentials tariffs will have the price increase delayed until the end of the winter. British Gas is also offering free insulation to any UK home owned by somebody over the age of 70. The news of higher prices comes after a year in which British Gas had managed to lure back some of the customers who had switched to other suppliers. British Gas cut its tariffs in March 2007, and then again the following month to reflect falling wholesale energy prices. Anne Robinson, director of consumer policy at the price comparison website Uswitch claimed customers were being ripped off. "They are making five times more per customer this year than they were last year," she alleged to the BBC.